Collect these 3D figural key chains! The ladies of the DC Super Hero Girls universe are here! Wonder Woman, Harley Quinn, Batgirl, Supergirl, Poison Ivy, Katana, Bumble Bee, Cheetah and more. Chase figures include Harley Quinn with a mallet and Wonder Woman with her shield! Display case contains 24 randomly selected, individually blind-packaged mini-figure key chains. 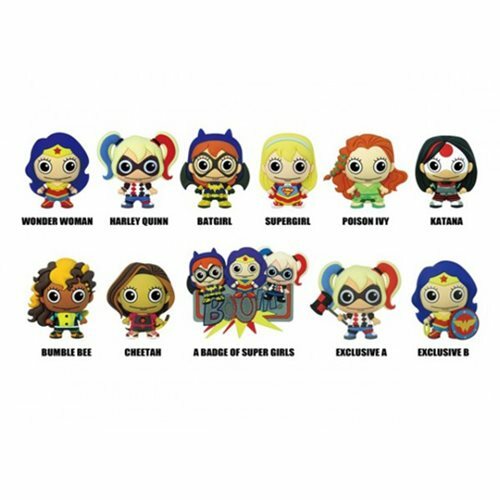 The ladies of the DC Super Hero Girls universe are here and waiting for you to collect as 3D figural key chains! The series features some of your favorite characters in blind-box packaging, and be sure to keep an eye out for the rare and special chase figures!